12.17 p.m. R1 22 Cape Ceilidh (5 g Cape Blanco – Minkum, by Minardi) – rider to be advised; is looking to resume in the $10,000 Maiden 1600 metres, but requires three additional defections to make the field. Fixed odds: $51.00 & $13.00. 12.52 p.m. R2 5 Sound Works (6 m Not a Single Doubt – Abu Zayan, by Mark of Esteem) – Jake Bayliss; ran home well for fourth last Friday in the Rating 65 1400 metres on Good3 at Tauranga, and backs up in the $22,500 Rating 65 1600 metres. 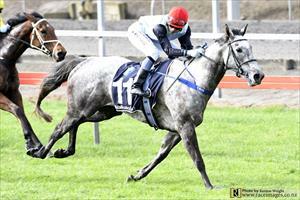 She acts well on slow ground and with further improvement would rate a decent each way chance. Fixed odds: $7.00 & $2.50. 1.27 p.m. R3 13 Ivette (5 m Jimmy Choux – No Reins, Show A Heart) – Jake Bayliss; followed a game fresh-up second with a compelling win in the Maiden 1400 metres, both at Matamata, and okay through the line when stepping up in grade on better going recently at Avondale. Back on the home course in the $22,500 Rating 65 1400 metres, she will appreciate track conditions and should run a good race. Fixed odds: $28.00 & $7.50. 4.24 p.m. R8 14 Ali Baba (6 g Savabeel – Dreamworks, by Maroof) – Jake Bayliss; has registered two wins and a fourth from his last three starts, all on this course, given slow and heavy going. Up in grade but down in weight to contest the $30,000 Rating 82 2000 metres, he strikes a competitive field but receives the right footing to measure up. Fixed odds: $17.00 & $5.20. 4.40 p.m. R8 6 Ruby Armani (5 m Makfi – Trujillo, by Saint Ballado) – Darryl Bradley; ended her previous campaign in terrific form, winning the ITM Anzac (Listed, 1550m), finishing second to Magnum (Per Incanto) in the Flying Handicap (Listed, 1400m) and third to She’s Poppy (Alamosa) in the Rangitikei Gold Cup (Listed, 1550m). She resumed in the Open 1200 metres on 21 September at Hastings, sustaining her run off a wide trip for fifth, and contests the $80,000 Rich Hill Stud Taranaki Breeders’ Stakes (Gr. 3, 1400m). She meets a few Group One performers in an even field and requires the right trip from barrier 10 to show her best. Fixed odds: $12.00 & $3.90.